This Queens mixed-use development will adaptively reuse former Jamaica Courthouse building. Image courtesy of FXFowle Architects. Residential and commercial development will incorporate Jamaica Courthouse facade. 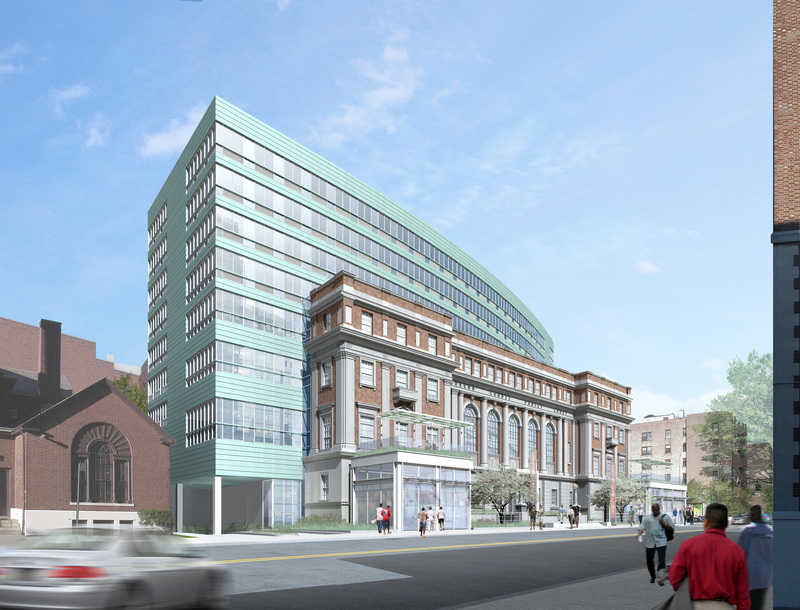 On March 14, 2007, the City Council unanimously approved four linked applications for the redevelopment of the Queens Family Courthouse located on Parsons Boulevard and 89th Avenue in Jamaica, Queens and vacant since 2002. The application included the sale of City-owned property, a zoning map amendment to increase the permitted floor area and allow residential uses, and special permits for base height, setback and a 500-space garage. The New York City Economic Development Corporation selected the project, to be developed by Dermot QFC LLC, after a summer 2004 request for proposals. The City will transfer the site to EDC for its transfer to Dermot. The development, designed by FXFowle Architects, will incorporate the existing courthouse facade into a new 12-story, 355,000- square-foot, mixed-use building. The majority of the building, 295,465 sq.ft., will contain 360 co-op and rental units. The remainder will include 41,510 sq.ft. of commercial space and 18,820 sq.ft. of community facility space. The design calls for a nine-story wing running the length of Parsons Boulevard and a 12-story wing fronting 89th Avenue, both with commercial and community facility space on the ground floor and residential space above. The building also includes two new one-level commercial sections. At the City Council’s Zoning and Franchise Subcommittee hearing, representatives from EDC and Dermot explained that planning for the project involved extensive collaboration with the community. Council Member Katz, the Land Use Committee Chair, said that she had disagreed with EDC in the past, but in this case EDC proposed a “great project for the community.” The subcommittee and Land Use Committee approved unanimously.